As my internship comes to a close, I find myself spending [possibly] an obsessive amount of time looking at Field Technician positions. Strolling through the different list-serves is eye-opening to the assortment of positions out there for biology nerds: a tech to search for dead birds along power lines, a tech to lunge themselves into the depths of underground caves in search of resting bats, a tech to spend two months in an isolated island that is regularly inundated by tsunamis to survey migratory birds (yes, this is a real job). Some of the announcements sound like something out of an episode of Bear Grills, fascinating, but terrifying to imagine yourself doing. One thing is for certain: you must be really passionate about biology if you’re going to withstand 120○F weather for 7 hours on end for the sake of finding one or two rare lizards. A common theme shared by all of these posts, besides needing to be head-deep in the pursuit of knowledge, is a basic skill: “must be able to withstand variable conditions.” Growing up I watched a lot of Animal Planet and National Geographic. There was a Saturday-morning broadcast where a strapping young man would take the audience on journeys deep into the jungles of Southeast Asia, where he would stealthily creep up behind a grotesquely huge python and mutter information about how easily the beast could strangle him to death. Enthralled, I watched every second at the edge of my seat, fantasizing about the day that I could jet set off to some faraway land to crawl through raggedy bushes in pursuit of neat animals. He made it look so cool, and so ruggedly glamorous. No field biologist is as elegant as the adventurists you see on TV. Those shows are just that: glamor. I would love to see a show that represented what field work can really look like: walking on a sand dune during 50 mph wind gusts and getting knocked over consistently by dust devils while losing tissue samples of the birds you painstakingly hiked to find to the wind; drinking the salty sweat dripping down your face in the blistering heat of a mosquito-infested lagoon while slowly contemplating exposing your skin to the swaths of hungry insects to walk your transect completely naked for the sake of temporary relief; walking for weeks on end with 50+ pounds stuffed into your backpack to find waterfowl nests, all the while not showering and hoping you don’t get attacked by a bear and praying the worms eating your away at your hand can be killed off with a simple cream; crossing paths with potential murderers as you creep through urban neighborhoods and forests in the middle of the night in search of bats surviving in human-altered habitats. The list of scenarios that I’ve heard of and experienced goes on and on, yet there’s hundreds of people across the country that line up for these jobs. Are we all crazy? No, we’re all mission-oriented. When you have an idea in mind, that is burned into your very core, you are capable of doing anything to hold true to your values. I’ve met technicians sorting through bird poop who looked up and smiled at me, excited to take the samples back to the lab and see what insects that animal was eating. Her goal was to assess the impact of ornamental plants in urban gardens, invasive species that do not host the same insect community and thus limits the availability of prey for migrating birds. While this sounds all hunky-dory, what’s the point? To borrow from the National Park Service, the mission is to “preserve unimpaired the natural and cultural resources and values…for the enjoyment, education, and inspiration of this and future generations.” This phrase may not pin on the head for every professional in the life sciences, but the sentiment speaks true to the ideal that Field Technicians are seeking: a way to understand and protect what we have. Walking down from the lighthouse I realize I must look ridiculous. Standing at 5’2, I stack on at least four layers of clothing to shield as much of my body as possible from the bitter cold wind. This effort ends up making me look like the ice-climber. In fact, my look comes complete with the big poofy rain pants, the round hiking shoes, the hooded bomb jacket, the scarf wrapped around my entire neck and face, and a scope hinged over my shoulder in place of a hammer. Visitors pass me by and always chuckle a little. Putting myself in their shoes, I laugh too, I know very well that my disdain for cold weather inspires a pathetic look in my eyes like the gaze of a sad, lost puppy. Scanning the parking lot, the fog violently slaps itself on to the paved plateau. I don’t blame it; particles of salt water get torn away from the surface of the Pacific from miles away, tossed together into a wind tunnel, and molded into a massive hand that berates the headland. The tsunami everyone fears has happened at Yaquina Head multiple times in the form of this fogged beast. Once relieved from its savage upbringing, the fog consumes the park, reminding each being–animal, plant, and human–the power of the elements. This is not the kind of day that one would want to be outside. And when I say “one,” I’m talking about me. Or so I thought. Once upon a time I convinced myself that I could only function in weather above 80 degrees. From working out here, I’ve learned that I am capable of withstanding anything because a little crummy weather is minimal to deal with in comparison to an unsettled conscience. The mission is what counts, an ideal for which many have and will continue to willingly sacrifice their comfort, sanity, and sometimes even pride. Putting my personal preferences aside has given me opportunities beyond my imagination. In only six months, I went from a total newcomer in an unknown land to a kayak guide on local birds, became a seabird observer on an open-ocean boat, got called a scientist by little kids (this occurrence was too cute not to mention), experimented with parasitology, hiked the Cascades for rare plants…the list goes on and on. While to you this may not sound incredible, being able to see the world from multiple perspectives has been the most rewarding learning experience I’ve had thus far. Had I stayed at home, in the comforts of my humid, hot summers, I would still be reeling under the wheels of regret and unsatisfied curiosity. Now there is something that is pointless. Settling my gaze upon the scene, I chuckle back at the visitors. As variable as the conditions are, it doesn’t prevent me from being excited…I cannot wait to see what awaits me next in my mission to understand and protect nature. Eagles are to America as Murres are to Yaquina Head. The Common murre colonies at Yaquina Head are a spectacle in themselves. Standing 60,000 strong, these birds spend their lives out at sea, flying in to large rocks slightly west of the headland only to lay an egg and raise a chick. While they are, as their name suggests, incredibly common–they are the most abundant seabird in the Pacific Northwest–this bird’s highly charismatic nature makes them the subject of much admiration and attention in the park. Imagine a penguin that flops around like a very clumsy Happy Feet character, which can fly, and never stops squawking. In fact, the Common murre is the Northern Hemisphere’s version of a penguin; it’s in the same family and forages in the same layer of the ocean (a murre can dive well above 400 feet in its search for food!). Couple all this with it’s stubby wings and clumsy flight pattern and you have quite possibly the cutest seabird of all time. However, all is not dandy in the lands of ‘Murre-ica’. A recent drama is unfolding on these rocks, causing the Murres and visitors alike to cringe under the auspice of change: the eagles have returned. Bald Eagles were once decimated from the area from DDT contamination. While this is sad for our national bird, the Murres rejoiced; this was a time of high abundance for their colonies. Conservation efforts slowly brought the bird back to fruition, up until the mid 1990’s when the Bald Eagle had finally returned. As part of its glorious comeback into the ecosystem came it’s hunger for the Murres. Meanwhile, the Murres, resolute in the calmness of their surroundings, evolved in a system with very few predators and unfortunately, were not ready for the impending reign of terror. The days of peace were over for the Murres. And so visitors will watch in terror as the Eagle swipes in to grab itself a quick meal, flushing out the entire colony in the process. Watching the chaos ensue is almost like a scene out of a fantasy movie: the dragon beats its heavy wings against the wind, hovering over the crowds of shuddering humans below…for a moment, it pauses, like the calm before a storm, until suddenly–in one clean dive–it plunges to the ground, opening its mouth wide and scorching the earth clean. The screams of the villagers running for their lives echoes through the mountainside as the dragon flies away with its prized catch of the day. The Murres act just as dramatically, they squawk and fluster around until finally they dive off the rock, leaving eggs and chicks exposed to the elements. After the Eagle leaves, other birds, like gulls, crows, Turkey vultures, and sometimes Brown Pelicans will come in and finish the job of Murre annihilation. This, of course, is simply nature in action. While a conclusion on the impact of the eagle’s disturbance is an ongoing project of Oregon State University’s Seabird Oceanography Lab, I don’t think of the Murre saga as such a terrible chain of events. In my personal opinion, the eagle is simply reintroducing itself back into a system that quickly forgot about its presence. As the eagle population continues to grow, it will be interesting to see how the behavior of nesting Murres change. Will the birds who hang tighter to the nests be the ones that survive to pass on their genes to the next generation? Or will those who flush, yet are lucky enough to have their nest left alone, be the successful candidates (not likely, but still a valid question)? Sometimes you see the Murres fight back, flinging their sharp beak at the impending threat–maybe they will build some kind of defense. Who knows…For now: tis’ the musings of a wannabe-scientist. While I pass my survey time contemplating the changing dynamics of this ecological community, visitors watch these events unfold in terror. The Murres are too charismatic to not cheer on; many visitors even start to develop a playful dislike of the Bald Eagles and will take advantage of my obvious interest in the colony to comment how the Eagles are ravaging the poor seabirds. Every two weeks I write a newsletter on the status of the Murre colonies and the activity of the Seabird Oceanography Lab. While it’s very scientific and direct, there is a sizable public following, distant Murre lovers rooting for ‘Murre-ica. Lately, I report nothing but bad news: the Murre colony has been abandoned, it’s an unsuccessful breeding year, there’s only a few chicks…the tragedies go on and on. 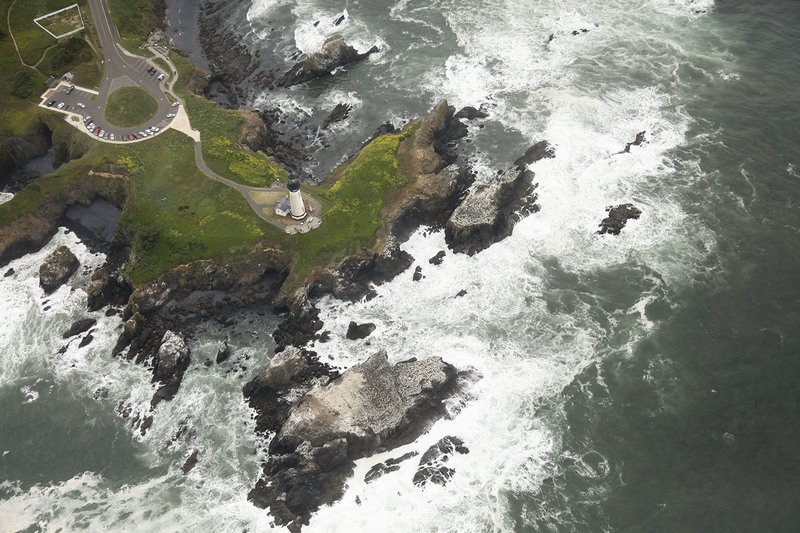 Its fun to see the public reaction to the trials of Yaquina Head’s nesting birds–it’s a testament to the power of birds to bring people together in interest of science. May Mother Nature bless ‘Murre-ica! I don’t know about you, but I’m tired of hearing about myself in this blog. So, to shake things up for a change, thought you may be interested in a new subject: the up-and-coming professionals of the natural resources world. I hope you have your rain gear ready, because these youngins are taking the field by storm. On Monday we introduced the following young professionals to the community served by one of our partners, Lincoln City Development Corporation. The panel was meant to highlight the career paths of young scientists trying to break into the natural resources field as a means to offer advice, insight, and inspiration for the tenants of a housing project. The event was intimate: we had only a few guests, but those who showed up had a high interest in the endeavors of our panelists, and our panelists were nothing short of amazing. The partner is interested in hosting similar events in the future. It is my hope that this is beginning of a community of sharing, where professionals can turn around and offer a hand to the next generation of scientists. This native Oregonian is a self-proclaimed enthusiast for the outdoors, a title well befitting of her passion for nature, wildlife, and expertise in environmental education. In her hometown of Eugene, Meagan often engaged in outdoor pursuits with her family, leading her to pursue a degree in Environmental Studies and Spanish from the University of Oregon. The formational experience of her career was an internship with the Bureau of Land Management, where she got to use her talent for the communication of science to implement education programs at Yaquina Head Outstanding Natural Area. Meagan went on to marry her love of nature, Latin American culture, and community development with her work with U.S. Fish and Wildlife Service. As a Program Coordinator, Meagan visits schools to teach children about the migrations of shorebirds from Latin America. Also, Meagan conducts public outreach, park interpretation, and fieldwork. Dylan has always held a fascination for plants. In Idaho, he learned about the biology of plants and quickly developed an intimate understanding of the medicinal, nutritional, and practical uses of different plant species. He went on to study Botany at Oregon State University and to serve as a WOOOF volunteer for organic farms in the United States. Dylan currently coordinates initiatives to protect the native flora of a Bureau of Land Management Natural Conservation Land. He impresses the staff on a daily basis with his profound knowledge of flowers, trees, grasses, and marine plants found within the park. Dylan will soon be entering the Peace Corps to work in sustainable agriculture in Senegal. Bethany has traveled great distances to pursue her passion for marine biology as an aquarist. While working on her Bachelor’s of Science in Wildlife Biology from Missouri State University, Bethany took an internship with the Dickerson Park Zoo. This first internship was a launching pad of adventure, from which she would continue to take internships in zoos and aquariums like the Henry Doorly Aquarium in Omaha, Nebraska and the Shedd Aquarium in Chicago. She is currently stationed in Newport as a student with the Oregon Coast Community College Aquarium Science Program and working as a Student Intern and Aquarist with the Hatfield Marine Science Center. Her expertise in the care of aquarium animals and inviting personality makes Bethany a wonderful aquarist! She expects to continue pursuing her passion in Springfield, Missouri at the Wonder of Wildlife Museum & Aquarium. Rolando has always held a fascination for plants, their structures and how they interact with other organisms. In Idaho, he studied Biology at the College of Southern Idaho earning an Associates of Science degree. He went on to graduate from Oregon State University with a Bachelors of Science in Botany. Rolando worked for two years in the Pankaj Jaiwsal lab at OSU working as a lab technician with bioinformatics and researching the genes responsible for environmental stress responses in Populus trichocarpa (black cottonwood). He has volunteered time through World Wide Opportunities in Organic Farming (WWOOF) at multiple farms around western Oregon and with Growth International Volunteer Excursions (GIVE) building a school in Nicaragua. Rolando currently coordinates initiatives to promote awareness of the importance of the native flora and manage invasive flora encroaching on the Bureau of Land Management Natural Conservation Lands. He impresses visitors on a daily basis with his knowledge of flowers, trees, grasses, and marine algae found within the park. Rolando will soon be leaving with the Peace Corps to work in sustainable agriculture in Senegal. Alessandra is an East coaster with roots in three different continents! Born and raised in Miami, Florida, Alessandra learned about the cultures of China and Panama through her mother. Elements of her background and natural disposition towards the sciences led her to fly west to Washington, where she now studies Biology in Whitworth University. Alessandra is a Research Experience Undergraduate scholar hosted by the Seabird Oceanography Lab of Oregon State University. This internship is National Science Foundation program that allows students to do research projects under the mentorship of university professors across the country. Alessandra’s is on the diet of seabirds that inhabit coastal rocks. A “Chinito!” This is a Cedar Waxwing, a beautiful bird found in the twinberry trees that line the kayak route in the refuge. Chinito is a common Spanish name for this bird. 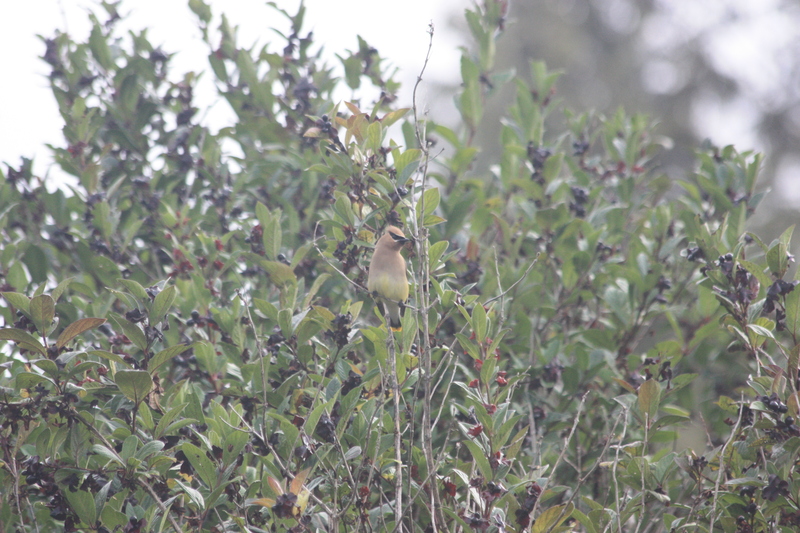 The tours highlight the cultural connection made possible by the movements of birds through the exchange of language and tales of the cultural significance of species like the Cedar Waxwing. Photo credit to Florence Van Tulder. 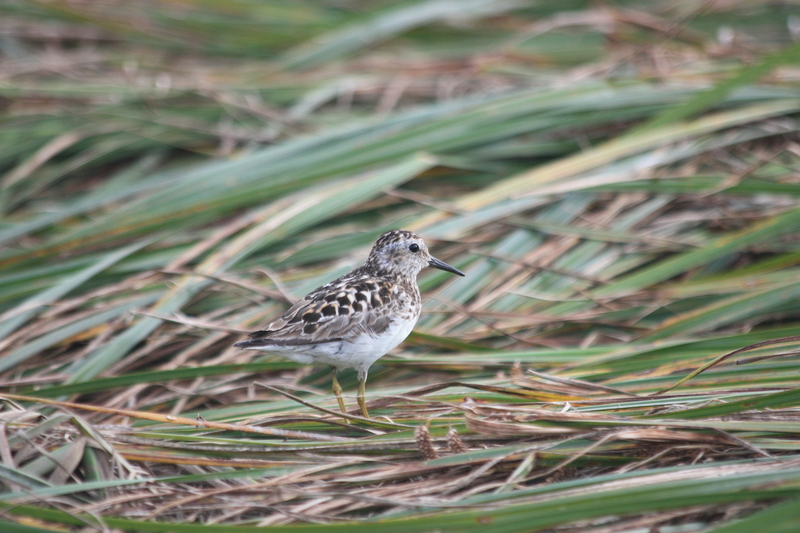 A flock of Least sandpipers flew directly overheard us and landed in the marsh grasses. We passed by so close to these birds that we could almost touch them–not something I would personally recommend to my visitors, though. It is great to know that the refuge is fulfilling its function as viable estuary habitat for shorebirds, songbirds, waterfowl, and raptors. Coordinating events can be stressful. What should we do? Where should we advertise? When should we do it? Who’s coming? How do we pay for it all? This can be a huge headache. The key, I’ve discovered, is to keep your eye on the prize: the result. Having a mission in mind is fuel for the roller coaster of event planning, and success. Last week my partner in crime–Meagan–and I launched an initiative to lead bilingual kayak tours, targeted to low-income communities in Lincoln County. These tours have been months in the making: in May we turned in an application for a USFWS grant to foster partnerships with surrounding agencies and connect the public with the outdoors, in June we made the posters and plugged the event to every media outlet imaginable (no restaurant, community center, or newspaper was spared) and spent a whole day tossing ourselves in a lake to train, and in July we drove around town to personally invite members of the community to join in the fun. Finally, after weeks of coordinating, a sea of calls came flooding in and we booked our first tour! It was incredible to hear interest from people who we directly targeted. All of them were interested in not just the free kayaking, but also in learning about the birds in the refuge in both Spanish and English. We ran the tour for 10 people from a housing unit next door to the refuge. The recruitment was the result of the tireless efforts of our partner, Lincoln County Development Coorporation, a nonprofit that offers classes, summer camps, and events for the residents of Lincoln County housing units. The Program Coordinator distributed our flyers and knocked on doors to tell people about our event. If it weren’t for her we would not have booked the tour with our target audience! 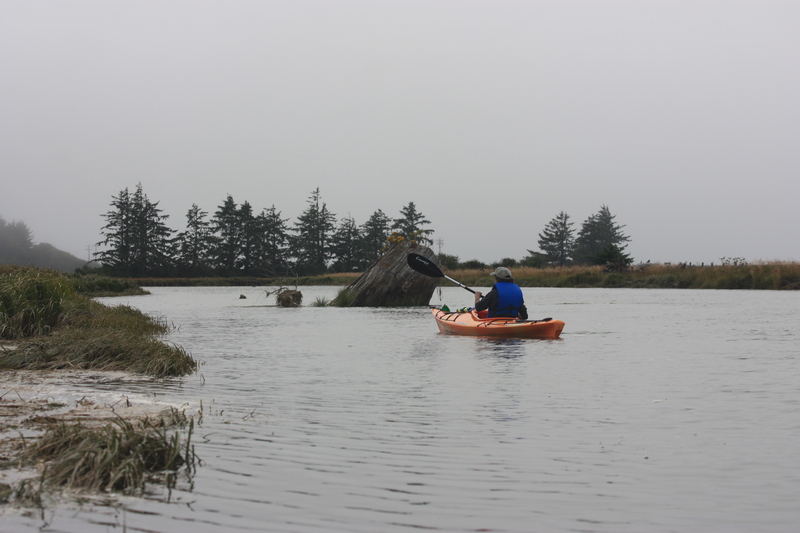 We took the visitors out on a .5 mile stretch of the Siletz River to enter the refuge from the back end. Depending on the winds and current, we judge on whether or not to reserve this hike on the river for the end of the tour. This particular evening had high winds, making it easier to paddle with the current than to fight it on the way back. Once in the refuge, we could bank out on the shore along the route and point out birds, plants, and animals to our guests. There is one point where you go under an old bridge. This bride is full of Barn and Cliff swallows, the latter which is nesting in the bridge’s supports. This is one of the only places in the Central Oregon Coast that Cliff swallows are nesting. The birds make for a good point of interpretation to illustrate the importance of protecting habitat for birds. It was also uplifting to see the guests make personal references to the Barn swallow, the Golondrina ranchera. One girl lit up with a big smile, recalling the bird from her grandmother’s farm in Mexico. It is our hope to draw these types of connections and ultimately inspire transformational experiences for guests that otherwise would not have an opportunity to directly engage with nature. This particular tour was very special in that many of guests, despite living minutes from the coast, have very limited experience with the ocean; time, money, and family constraints keep them from exploring the natural treasures of their area. Programs such as the bilingual nature tours provide a culturally sensitive environment for guests to ask questions, explore, and simply enjoy the wonders of the outdoors. Some may beg to differ, though I like to believe that the show Portlandia is pretty dead on to the persona of Portland. Exaggerated, but accurate. Of all of the skits, the famed line “Put a bird on it,” a tactic to make any mundane item marketable by slapping a bird silhouette on it, rings truest. On my second excursion to Portland I got to indulge in this fervor for birds in the Tualitin National Wildlife Refuge Bird Festival. A week after hosting our own IMBD event on the coast, it was a lot of fun and eye-opening to see how another region expresses their love of birds, display their conservation efforts, and conduct outreach to the public. The event was open to the general public, though there was a concerted effort to invite the Latino community to join the festivities. The coordinator reached out to Meagan, Stephanie, and me with suggestions on how to do this, and shared some notes on their communications tactics. The result was a feature on Spanish-language news stations, like Univision, and newspapers. Being at the event, I would say their efforts paid off: the event’s audience was highly diverse, with participants of all ages, backgrounds, and abilities strolling from the arts-and-crafts station, the nature trails, and the science displays. I was helping as a Spanish-language interpreter at a station on riverine mammals and had several opportunities to practice my Spanish, and simply chat with the public about cool birds they could see in the refuge. My favorite visitors were a little boy and girl, brother and sister, who were fascinated with a Chickadee. I took a short walk with them down the trail and lent them my binoculars, explaining why the Chickadee sings, and how they can tell it’s a Chickadee. The two were so enveloped in birding that the parents had to jokingly convince them with promises of food to peel them away! It was lovely to see children from the city connect with nature in a way they never thought was possible. A selfish part of me hopes that their curiosity for the world continues into a career in science! One can dream, though surely with the efforts of entities like the Tualitin Wildlife Refuge of the U.S. Fish & Wildlife Service urban residents of the Portland area will have plenty of opportunities to dive deeper into the world of biology. For now, putting a bird on it is definitely a great start! The path at the Tualitin Wildlife Refuge led to an array of activities, like my Beaver station, an archery game, a bird banding demonstration, and interactive games related to fisheries. Needless to say, I was a little obsessed with this human-sized Eagle nest. As I was taking a break to go eat, I wandered into a little trail which led into an open meadow. To my surprise, I found this treasure. The display invites visitors to hop inside and get a sense of what it’s like to be a bird in a nest. I couldn’t resist the temptation and took my shot at being an Eaglet. Also discovered in one of the paths: a fisheries display! This particular jewel shows off the life cycle of a frog. The table had several other boxes with the life cycles of fish and amphibians found in the refuge, and a demonstration on how samples are collected. Beaver, nutria, and river otters–oh my! This was my station at the event. For the first hour, I was in the company of a USFWS staff who works with mammals in the refuge. It was fascinating to learn about the natural history of these animals, particularly the invasive species of Nutria. I’ve actually seen this animal in it’s country of origin, Argentina, and had no idea it was present here in the US, let alone how much of a nuisance it is! The nutria was brought over as a substitute fur for beavers and released into the wild. Now it burrows into the banks of streams and under the foundations of houses, and takes up the habitat of beavers and otters. Portland is still figuring out what to do with it. Yikes! Toilet paper tube bird! This was one of the arts-and-crafts activities available for visitors. Stephanie was in this section of the event and showed off this cute creation to us! Bring good luck to your home with this painted Ladybug. Also in the arts-and-crafts area, children could paint rocks in the form of insects and animals. Definitely keeping this idea on tab for next year!